This is the second part in a multipart series1 about using an iPad to do information gathering and processing. In the first part, I focused on using iCab as a web browser. While iCab is an excellent general purpose browser, there are some other tools I rely on for specific tasks. This post describes those applications and their strengths. That's right, a dictionary is still one of my primary reference sources. Inconceivable! "You keep using that word. I do not think it means what you think it means." 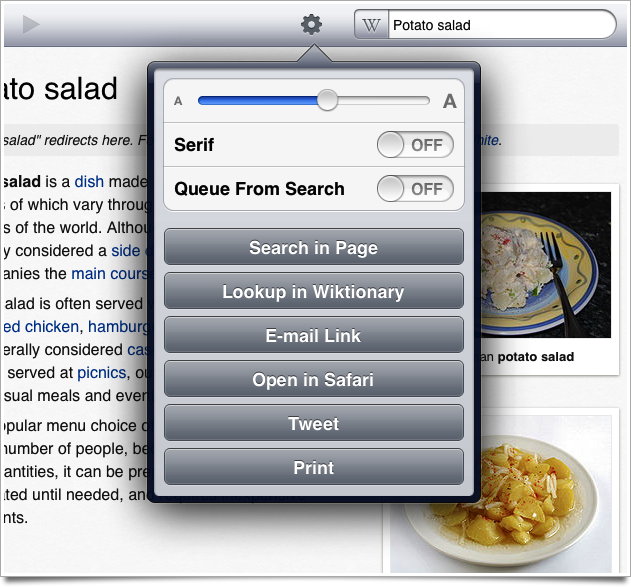 For a basic dictionary, there are a number of good options for iOS. I find WordBook XL to be an all around good starting point. The app provides basic definitions on its own. But it is also a search engine that integrates with Wikipedia, dictionary.com and many other sources. Among WordBook's prize features, the notepad is very convenient. WordBook calls these bookmarks, but they are more than just place holders. I can take a variety of notes as I work and WordBook tracks the page that the note refers to. When I browse the notes, I can see exactly the word it pertains to. When I browse the topic again, I'll see my note listed at the bottom of the screen. WordBook also provides basic extensibility. It can be configured to integrate with any webservice that provides a URL scheme for lookups. Google, Urban Dictionary as well as Wookieepedia. 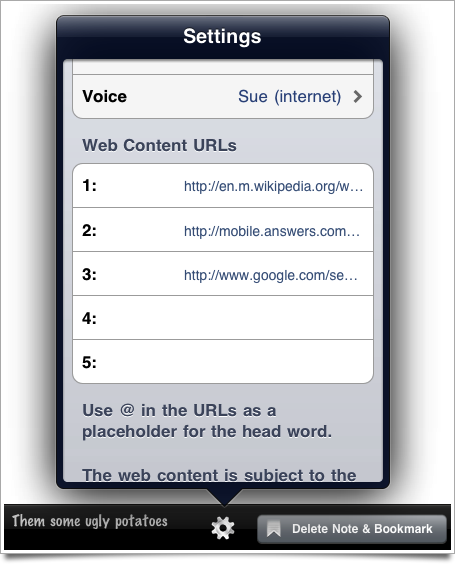 To configure Urban Dictionary as a source, I add a Web Content URL with an "@" placeholder. Unfortunately, these extra sources are not directly integrated into the UI. They are a web view onto the main page of results for the search term. 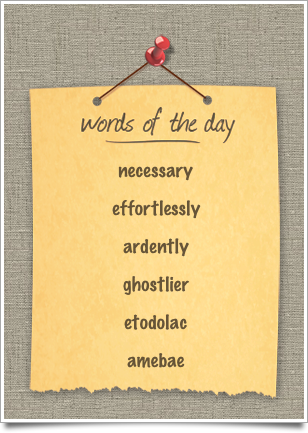 WordBook also has some nice leisure time features, like a crossword puzzle solver and a word of the day panel. Neither is something I spend a lot of time with, but they are fun for the occasional mental stimulation. Terminology is WordBook's prettier, vacuous sister. 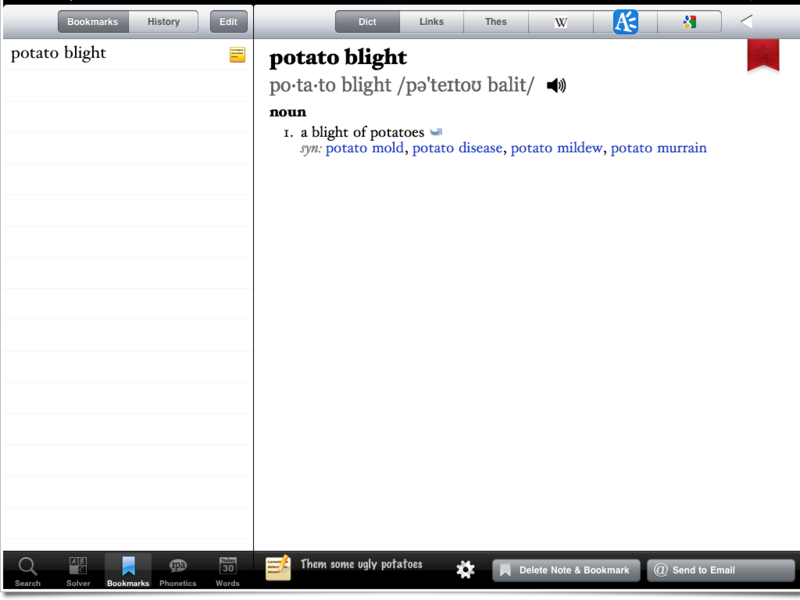 It's a very attractive application but it does not have the deep feature set of WordBook. If I am just looking up a quick definition or pronunciation guide, Terminology works well enough. 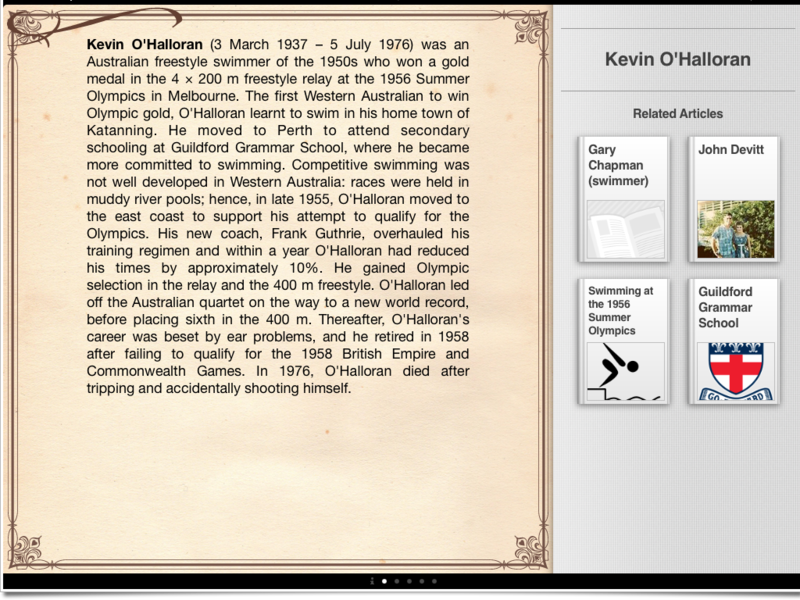 The best feature of Terminology is direct integration with a select number of other iPad applications. 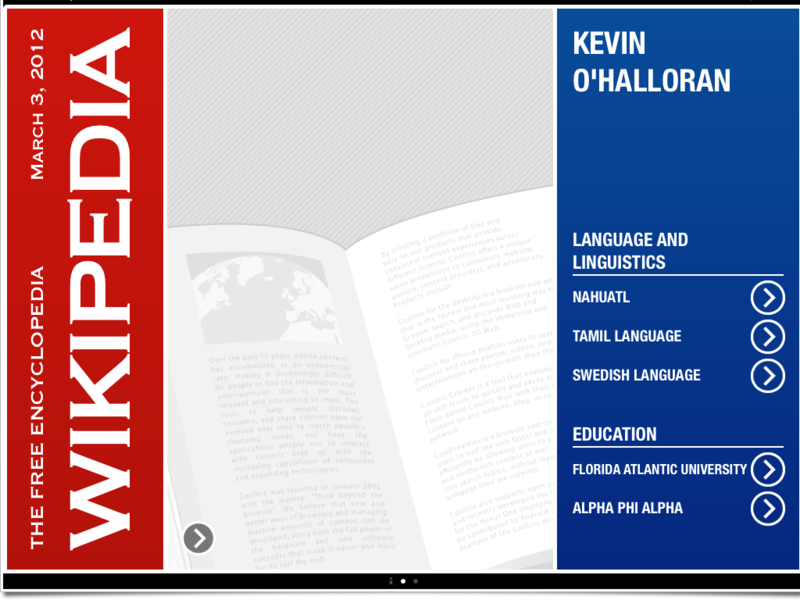 I can send a term directly to Wikipanion for example, rather than browsing through Terminology. The majority of the Terminology connections with other services are through a web view. Once in the web view, it's no different than just working in Safari. One of my most commonly used sources is Wikipedia. It is an excellent starting point for just about any topic. It tends to be more right than wrong, but it also includes external links to follow. Wikipanion Plus is my main Wikipedia app. It has a pleasant user experience and a solid feature set. Where it beats all other Wikipedia apps is in its ability to copy a freaking link. This is the Achilles Heal of every Wikipedia app. They silo themselves. They anticipate reading and nothing more. I want to read and capture information and the link back to the source. Wikipanion makes this easy. Tap and hold on a heading in the left pane, and I copy the direct URL to that section. 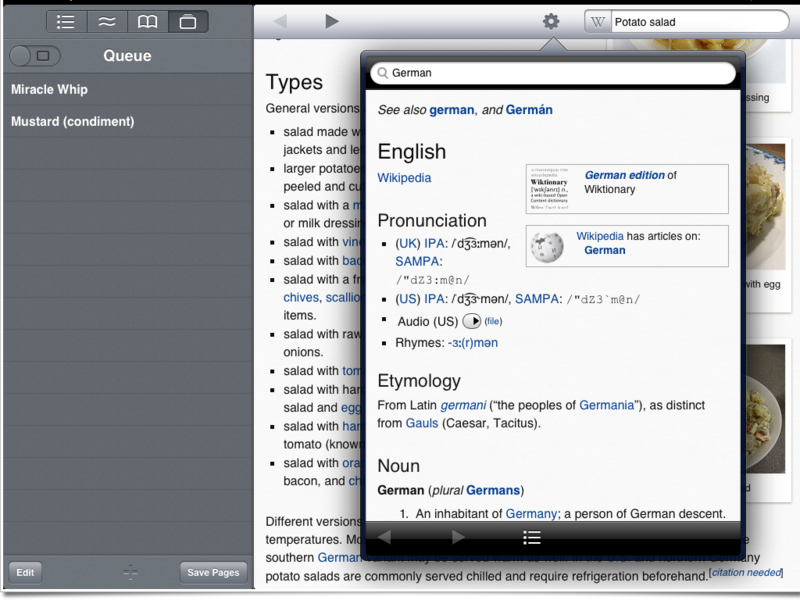 Wikipanion also provides the other niceties I expect in this genre of apps, like bookmarks, opening links within the app and integration with Wiktionary. Beyond that, Wikipanion has some helpful bonuses. Bookmarks can be marked for saving offline. The search in page function is also easily accessed. Discover by Cooliris is unlike any other Wikipedia app I have used. The app provides a random sampling of themed articles each day. Some days are better than others, but I almost always find something randomly amazing. There's a lot of attention to detail in this app. Page layout is nice and there are subtle animations during topic transitions. Discover is a lot like Zite (see below) for me. It's more leisure than research, but it's a great way to take a break and learn something new. 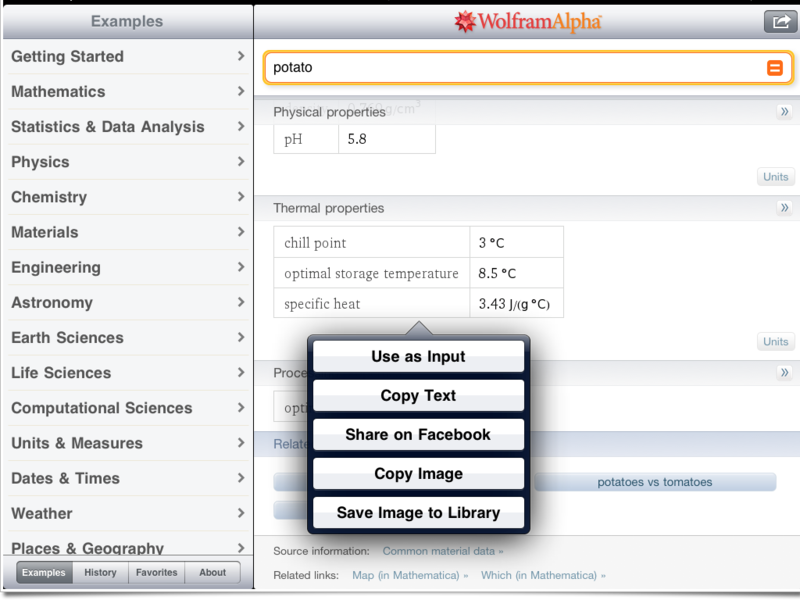 Yes, Wolfram Alpha is a Web site. Yes, it works well on mobile Safari. One screenshot can sum up why the app is better. 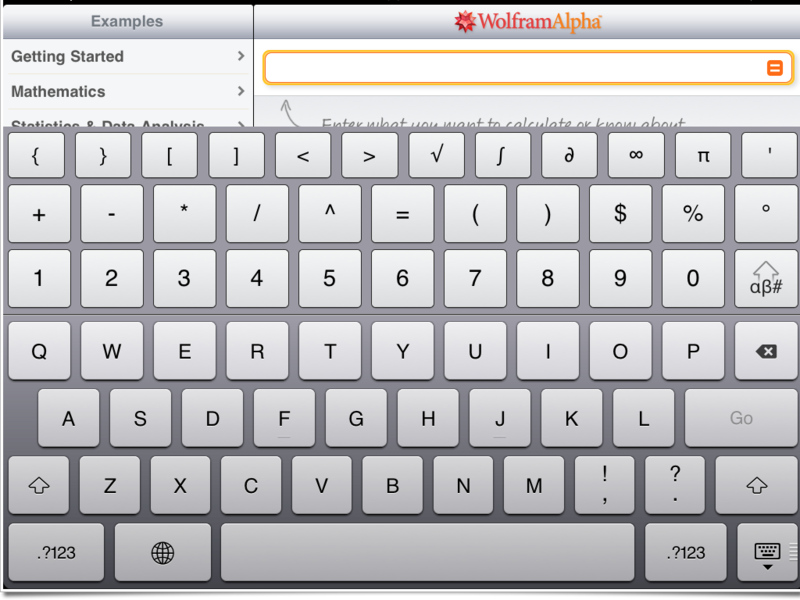 That keyboard may hold a record for iOS but it's darn useful for searching. The search results in the app are quite attractive as well. Holding down on text provides an action popover that makes drilling into further results easy. The iOS app also keeps a running history of my searches and fishing expeditions. No need to continually tap a back-button in Safari or iCab. The app also provides an area to save searches and results. 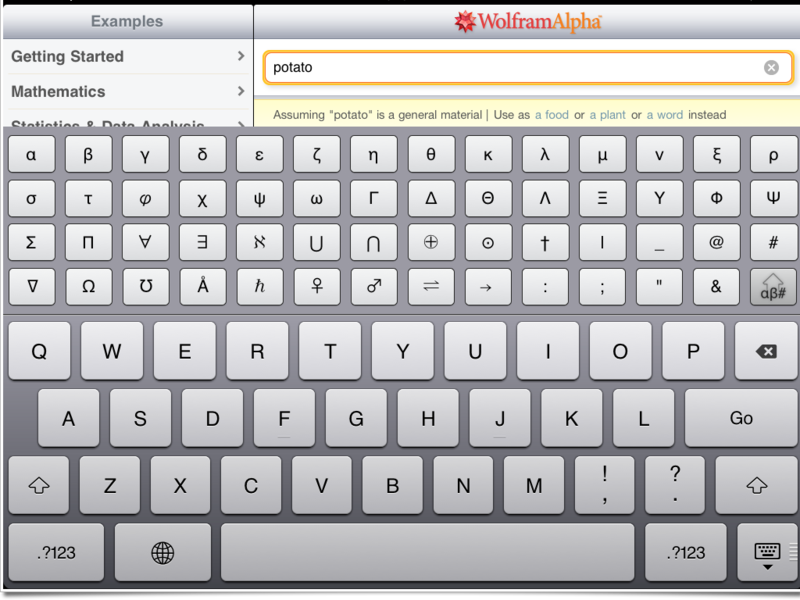 This is how I use Wolfram Alpha. I search and explore, saving items of interest. When I'm reading to think more deeply, I will go back and browse what I saved. 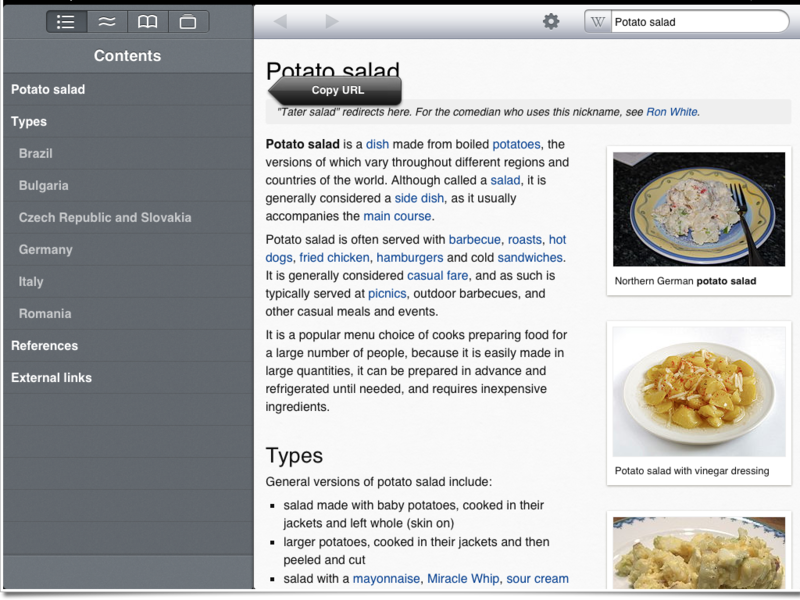 Dbd is the only bookmark management app for iPad that supports Pinboard. I've reviewed it in the past and not much has changed. It's still great. When I need to lookup a bookmark on Pinboard I use Dbd. If I need to explore Pinboard's subscriptions or do deep archive searching then I use the webpage. Other than that, Dbd gives me complete access to almost everything Pinboard does but with an interface designed for my iPad. Zite isn't really a feed reader. It's a news service that I bias with preferences. 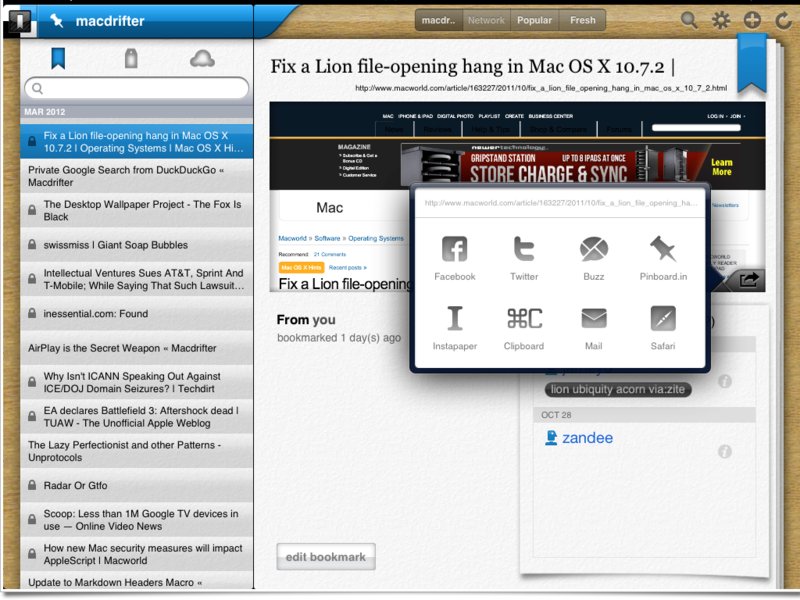 Zite starts by analyzing my RSS and Twitter feeds. I then choose categories of information I'm interested in. Zite offers suggestions based on, what I assume, is popularity as well as how I've rated articles in the past. I can give a specific article a thumbs up and Zite remembers. Same for a thumbs down. I can also choose to block all content from a particular source. After using Zite for many months, my news is just about perfect for my taste. It's not a reproduction of my RSS or Twitter feeds. The content is different and often pulled from sites I may not otherwise visit. As you may guess, my Zite service is chocked full of Apple news. But it's also equal parts science, brewing and programming articles, with a bit of politics thrown in. While I read Zite during my leisure time, I have several categories just for research. I have a Python channel as well as an AppleScript and iOS channel. Periodically, I will just check-in to see what's new and I almost always find something interesting. Zite is not directed research. It is a tool for finding a place to start. I switched from Google Reader to Fever awhile back. For a review, see my earlier post. Fever is superior to Google Reader in almost every way that matters to me. As I read articles, I favorite them and send them to Pinboard and Instapaper. Instapaper is to read longer material and Pinboard is a bibliography of things I think are valuable resources. Most of the time, Twitter feels like a crowd of mentally-ill patients standing on a corner screaming into the sky. With proper tools (and medication) Twitter can be a very good source of reference material. Searching can be a challenge, but the hardest part to deal with is the impermanence of the Twitter stream. Marking a favorite does not guarantee it will be available later. I've praised Tweet Library in the past. Not for it's expertise as a Twitter client, but for it's functions for saving and filter tweets. Twitter is a wealth of information if it is properly mined. Tweet Library provides a mechanism to sift through the mountains of garbage to find the one gem I'm looking for. Tweet Library is also the only tool where I can create a collection of tweets and then make them available back on my Mac. Tweets can either be downloaded directly through iTunes or made available through Riverfold's webservice. This is invaluable when doing research with Twitter. Previously I needed to favorite all tweets I was interested in. Then I had to get the links or content copied before Twitter nuked them off their timeline. Tweet Library stores them indefinitely (or close enough for my needs). What can I say that has not already been said about Tweetbot? And said better. It's the best Twitter app on iOS. It does everything I need and I'm quite happy with the features. The iPad version is my preferred window into Twitter. Calculations are not primary references but rather a way to verify or transform data I find on the web. Sometimes it as simple as doing the basic math someone else neglected to do. Other times, it is determining a trend. My iPad can do almost anything I need my Mac to do in this regard. My needs are fairly basic. I grew up using RPN calculators from HP[^hp] and I still think backwards when using a calculator. The best RPN calculator available is still PCalc. I loved my HP48SX calculator but I love PCalc more. I only use about 1% of PCalc's potential, but that's no different than my Mac, iPad or Cable TV. Soulver takes a different approach to calculations. It's designed to be used as an intelligent notepad. 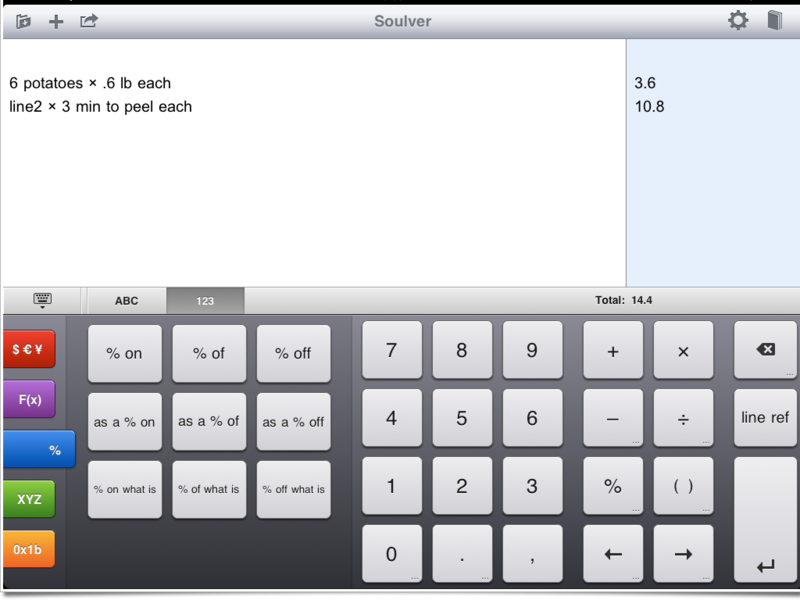 When I'm not quite sure what I want to calculate, Soulver is a good place to start. I can write out notes that include numeric values and plain text descriptions. Soulver quietly performs the calculations, showing the results as I go. Oh, and I can sync these calculation notes through Dropbox. I've described an off-beat use of Apple's Numbers application for tracking my beer inventory. But I also use Numbers as a general purpose data analysis tool. It's a spreadsheet. That's what it's good for. I typically only end up in Numbers if I need to work with a data set. It's not practical for simple calculations, although it will work. I use IMDb for leisure and research. I'm not a "cinema" person but I like a good movie. I also like to add little easter eggs to posts. I write Macdrifter for my own entertainment. IMDb enhances my entertainment and maybe generates a couple knowing chuckles from people reading it. 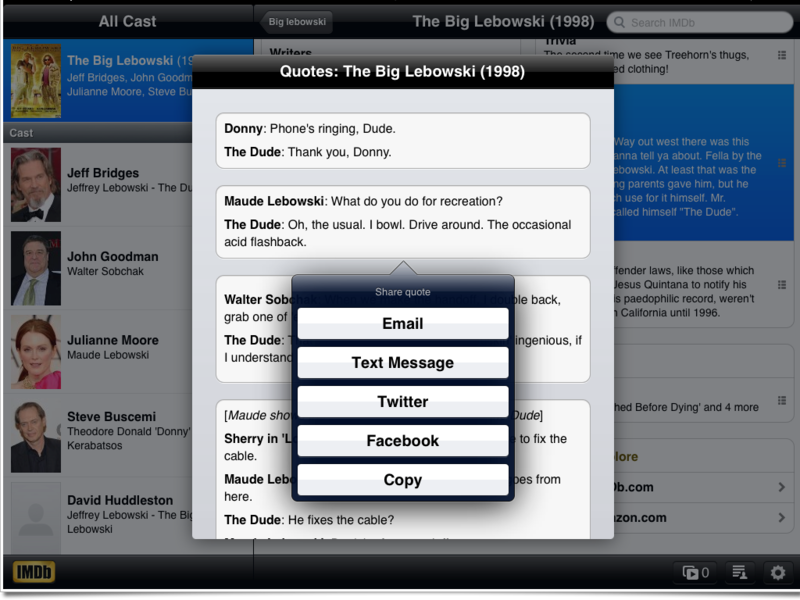 Many of the movies listed in the IMDb app include a detailed and lengthy quote section. The IMDb iOS app is superior in every way to the Web site. I never even bother with the Web site. The app even provides a convenient mechanism for copying quotes. If for some sick reason I preferred the Web site, the app even provides a webkit pane to view the content without leaving the app. The only thing the app lacks is a mechanism for copying the link to the page on the Web site without opening the page in Safari. This is going to seem like an oddball reference source, but 1Password provides some very convenient features for quickly accessing forums and secure Web sites. If I am looking to search the Noodlesoft forums for some Hazel tricks, it's tedious to open the page in iCab and login. I never remember these forum logins. 1Password solves that for me. I can search for the the bookmark in 1Password and login through the app. 1Password takes care of the entire process, including login. I often try to solve problems with scripting. 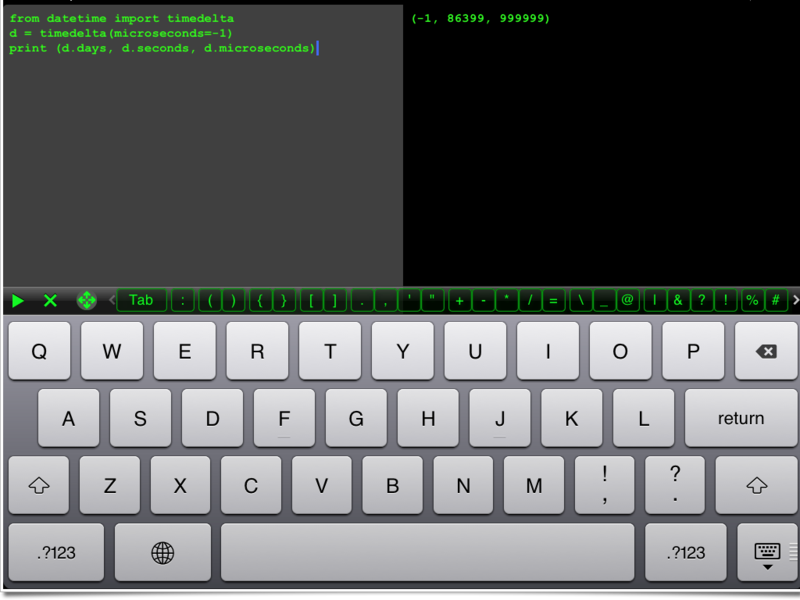 The Python For iOS app on my iPad provides a quick way to research and test basic Python scripts. Unfortunately there is no way to load external modules, but for the basic stuff this app is very good. Scripts can be saved through either cut-and-paste or through file export. There is also a convenient Python Documentation browser for references. It's a no frills experience, but very practical. The editor is customizable and comes with an interactive mode. I particularly like the implementation of the extra keys on the keyboard. They are small enough not to waste screen space, but easy to tap. There are a lot of great resources on the web. Many of them have a hostile user experience, either because they are slow or awkward or are just poorly designed. Native iOS apps can solve that problem by providing inputs that are designed touch interactions. Some apps have done such a good job that I prefer the app to the browser, even when I am at my Mac.